In an unbelievable story a cop handcuffs and detained a firefighter for 30 minutes while the firefighter was trying to do his job at a crash site. The cop claimed that he asked the firefighter to move his truck, but the firefighter refused, stating it was parked in such a way as to protect those working the scene. Just when you think that police in this country can’t get more out of control…well, here you go! 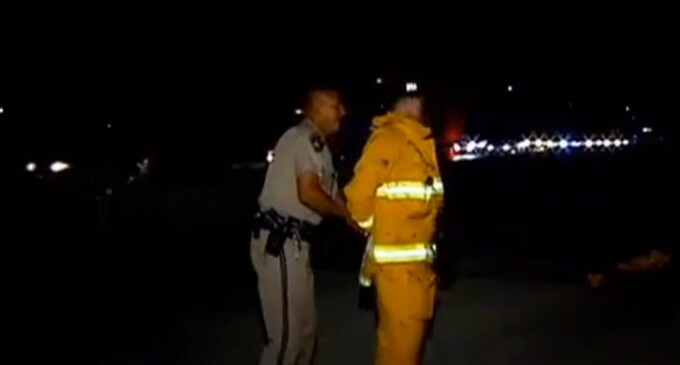 A California firefighter was recently placed in handcuffs and detained by highway police while helping crash victims, all for refusing to move a fire truck after being told it was parked inappropriately in the midst of an emergency. The incident occurred Tuesday evening when local firefighters and members of the California Highway Patrol responded to a rollover accident in Chula Vista, CA. The city’s firefighters were first to arrive on the scene, where they parked their fire trucks in a way to block oncoming traffic and protect those at the crash site. When CHP officers reached the scene, however, they began ordering the firefighters to move their trucks out of the traffic lanes or face arrest. According to the local CBS affiliate KFMB, one officer had already directed a fire engine to leave the scene with its paramedic onboard before they could finish administering medical aid. Another officer, meanwhile, told firefighter Jacob Gregoire, 36, to move his vehicle. Gregoire, a 12-year veteran, refused and continued assisting crash victims when the officer then placed him in handcuffs and lead him to a police vehicle. He was detained for about 30 minutes before being released. One driver was reportedly transported to the hospital after the accident, but there’s been no word on the second driver or on the conditions of either one. Videos and photographs of the incident were captured by KFMB and posted on the internet, sparking outrage among many commentators who couldn’t believe what was happening. Chula Vista Fire Chief Dave Hanneman called CHP’s behavior “ridiculous” in a statement, while the firefighters’ union president John Hess praised Gregoire’s actions. The aftermath of the incident has revolved primarily around who was in the right legally. Speaking to the San Diego Union-Tribune, the city’s fire deputy chief Steve Ricci acknowledged that CHP has jurisdiction over the roads, but said that since firefighters arrived on the scene first they had initially taken command of the situation. “As to a formalized transfer of command to the CHP — I don’t believe that ever took place,” he added. The so called cop should be FIRED FOR INTERFEARING. HE COULD HAVE CAUSE SOMEONES LIFE. The firefighter put up with it. He did not uncuff himself and kill the cop. Therefore, the firefighter deserves it. At this point, we all deserve it. $#%&[email protected]* us. Seriously. We are pussies. We deserve all we get. Next time I get arrested and caged and raped, I will deserve it. Not because of anything I did. But because of all the things I didn’t do. Or even try. Stupid cop, where is the common sense? Political correctness comes before, everything else. You can not Fix Stupid. whats the police officers name ,obama,? sounds like something he would do,unless he was a democrat!!!!!! nice urging commented here, I am really enjoying by these.